Data business planning is a relevant topic to State DOTs as they work to meet requirements for safety data collection, integration, and analysis to support a safety data system. 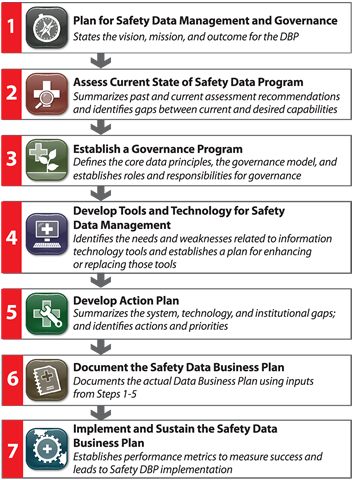 The Guide for Safety Data Business Planning provides guidance for State DOTs to develop and implement a Safety Data Business Plan, using the Seven Step approach to the right. A Safety Data Business Plan provides a roadmap for States to improve their safety data management and governance practices. These improvements enhance safety data to support safety decision-making. The project can help agencies develop an approach for improving their safety data management and governance practices. Doing so ensures States have better quality data to support safety decision making aimed at improving safety on all public roads. FHWA invites State DOTs to contact the project manager, or their Division Office staff, to request technical assistance in developing their own Business Plan for Safety Data Integration. The Guide provides practical instructions for State DOTs to follow in developing, implementing, and maintaining a Safety Data Business Plan. Agencies can use the following steps in the Guide to develop a Safety Data Business Plan. The work products of Steps 1 through 5 culminate in the development of a Safety Data Business Plan in Step 6. A State implements the Safety Data Business Plan in Step 7. This case study summarizes how the Michigan Department of Transportation incorporated a data governance structure into their standard business operations and how it has improved their safety data systems and processes. This case study highlights noteworthy practices of the New Hampshire Department of Transportation in leveraging technology to enhance safety data management. This case study highlights innovative data management strategies at the Utah Department of Transportation that support the use of technology to benefit safety programs. Pilot studies are being conducted for two agencies to test the Draft Guide, ensure its usefulness, and identify where improvements could be made to better support States’ efforts to develop, maintain, and govern an effective safety data system. The pilot studies include developing tailored Safety Data Business Plans for each State. Once they are complete, a summary of the studies will be available here. Below are brief descriptions of the purpose for the studies. Kansas Department of Transportation: The purpose of this pilot study is to assist Kansas DOT in developing a governance framework to better manage safety data resources and assets. This framework will help define and align data governance rules, policies, and processes to improve data consistency, transparency, quality control, coordination with the IT governance structure, and knowledge management. The Safety Data Business Plan will provide a roadmap for prioritizing and implementing safety data collection activities and system improvements. Washington State Department of Transportation: The purpose of this pilot study is to assist Washington State DOT in developing a Safety Data Business Plan that demonstrates how safety data impacts the overall enterprise. This will be accomplished by developing a roadmap to address safety data linkage, association, and management, as well as developing a strong, sustainable vision for safety data. The Safety Data Business Plan will help Washington State DOT communicate the importance of safety data in achieving the policy goals of the organization, as well as implement a sustainable safety data improvement process. The FHWA Office of Safety established the Roadway Safety Data Program (RSDP) to advance State and local safety data systems and safety data analysis and evaluation capabilities. Click the link below for information on training opportunities. The RSDP Toolbox offers resources to help your organization build a new or strengthen an existing roadway safety data program, in the form of guidance, tools, and reports to assist State and local agencies with data collection, data analysis, and data management.